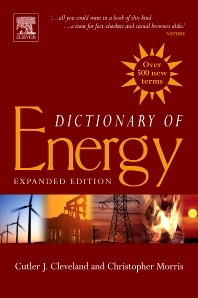 At a time when the topic of energy prices, resources and environmental impacts are at the forefront of news stories and political discussions, we are pleased to announce the publication of the exciting new Dictionary of Energy. This authoritative resource, called "an essential reference for energy researchers" by Mark Jaccard, Director of the Energy and Materials Research Group at Simon Fraser University, covers all aspects of energy and its role in society. Co-edited by Cutler J. Cleveland, the Editor-in-Chief of the widely-acclaimed Encyclopedia of Energy, and Christopher Morris, the Editor of the award-winning Academic Press Dictionary of Science and Technology. In a single volume this unique work provides a comprehensive and organized body of knowledge on what is certain to become an increasingly vital area of scientific study in the 21st century. An essential reference companion for anyone with an interest in energy, including scientists, consultants, journalists, economists, educators, students and policy-makers. Cutler J. Cleveland is the Director of the Center for Energy and Environmental Studies at Boston University, where he also holds the position of Professor in the Department of Geography and Environment. Dr. Cleveland is Editor-in-Chief of the Encyclopedia of Energy (Elsevier Science, 2004), winner of an American Library Association award, Editor-in-Chief of the Dictionary of Energy (Elsevier Science, in press) and Editor-in-Chief of the journal Ecological Economics. Dr. Cleveland is a member of the American Statistical Association’s Committee on Energy Statistics, an advisory group to the Department of Energy, and a participant in the Stanford Energy Modeling Forum. He has been a consultant to numerous private and public organizations, including the Asian Development Bank, Charles River Associates, the Technical Research Centre of Finland, the U.S. Department of Energy, and the U.S. Environmental Protection Agency. The National Science Foundation, the National Aeronautics and Space Administration and the MacArthur Foundation have supported his research. Dr. Cleveland’s research focuses on the ecological-economic analysis of how energy and materials are used to meet human needs. His research employs the use of econometric models of oil supply, natural resource scarcity, and the relation between the use of energy and natural resources and economic systems. Dr. Cleveland publishes in journals such as Nature, Science, Ecological Modeling, Energy, The Energy Journal, The Annual Review of Energy, Resource and Energy Economics, the American Association of Petroleum Geologists Bulletin, the Canadian Journal of Forest Research, and Ecological Economics. He has won publication awards from the International Association of Energy Economics and the National Wildlife Federation.